Pro for on the Go? The TravelMate 8572TG, with switchable graphics, is supposed to be the perfect notebook for all users on the move. It provides good performance with a Core i5-430M CPU and Nvidia GeForce 330M graphics and can be switched to the integrated graphic chip for saving energy. 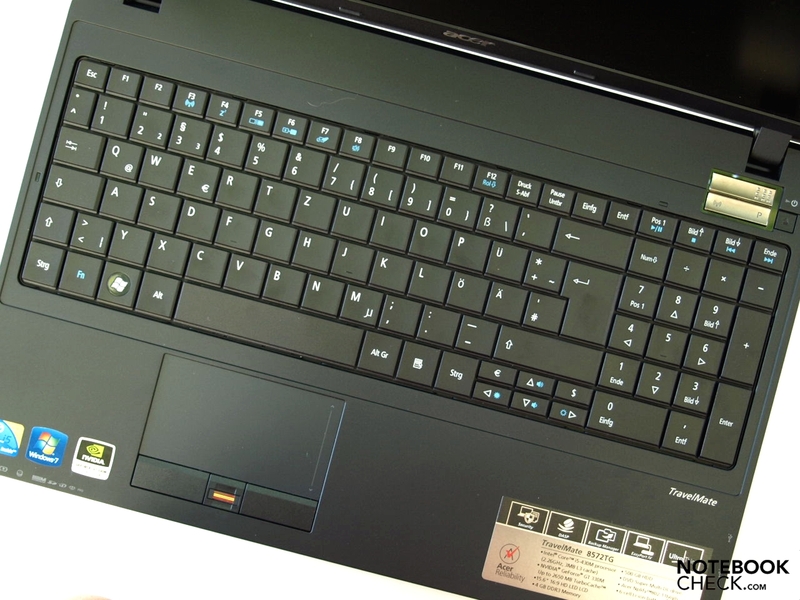 The TravelMate 8572T series allegedly supplies business travelers with pro-laptops. Aside from models that exclusively use the integrated GMA HD graphic card, the 8572TG also includes models that can optionally be used with the additionally implemented GeForce 330M graphic card from Nvidia. 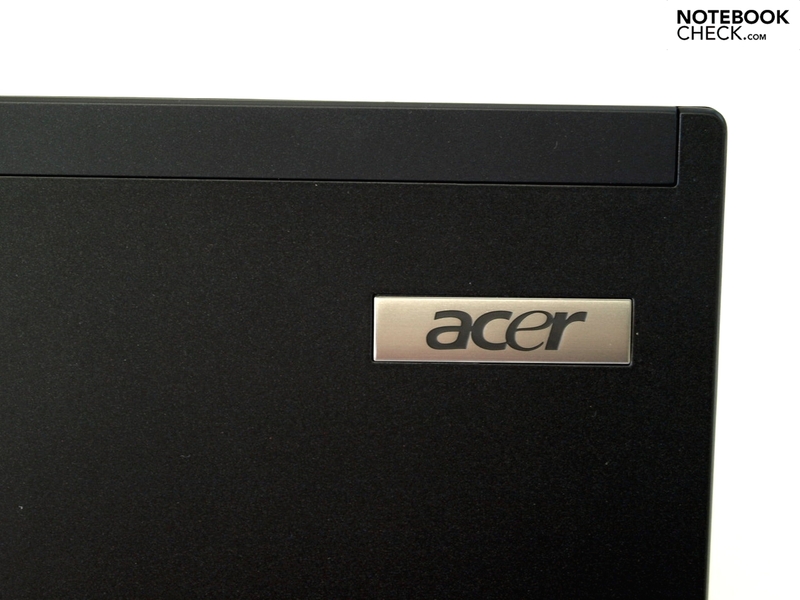 The Acer TravelMate presents itself almost completely in black and thus accordingly business elegant. A few chrome elements, for example buttons and logo, and the inevitable stickers are the only eye-catchers. The power button, which has some resistance when it's pressed, is designed as a slider. The base unit shows an excellent torsional stiffness and good pressure stability. And again, the area around the optical drive proves to be a weak spot under selective pressure in the test. 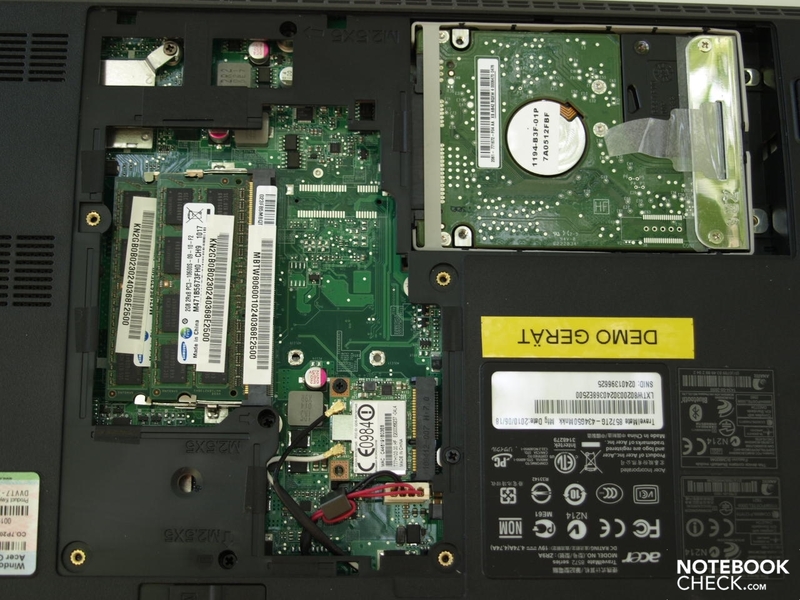 The bottom is stable and also has a large maintenance cover, which grants access to the WLAN module, hard disk and RAM. 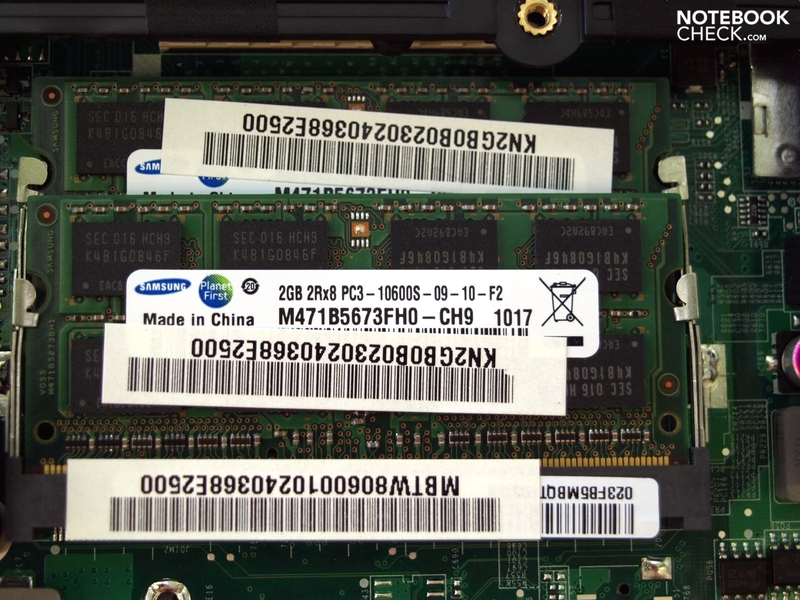 If need for a RAM upgrade comes up, it can even be done easily by a layman. However, at least one of the two 2G bars will turn out to be unnecessary. 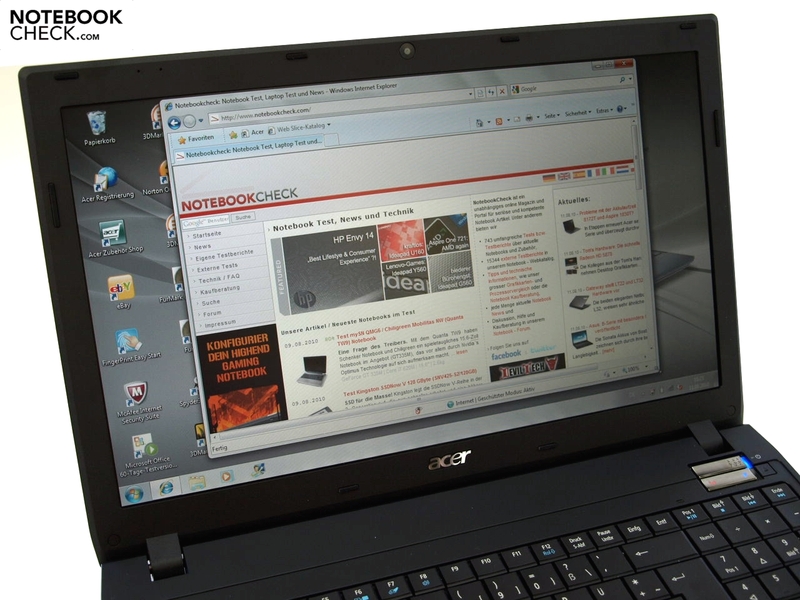 The thin display lid stands up to the twisting forces that develop when the notebook is picked up at one corner to some extent. We can't see any image distortions on a turned on screen in this case, however a very audible creaking is perceived. The display bezel partly yields considerably under selective pressure, whereby image changes turn up on the activated screen. The hinges seem almost a bit too small in relation to the laptop size. They are fairly stiff so that a single-handed opening isn't possible. 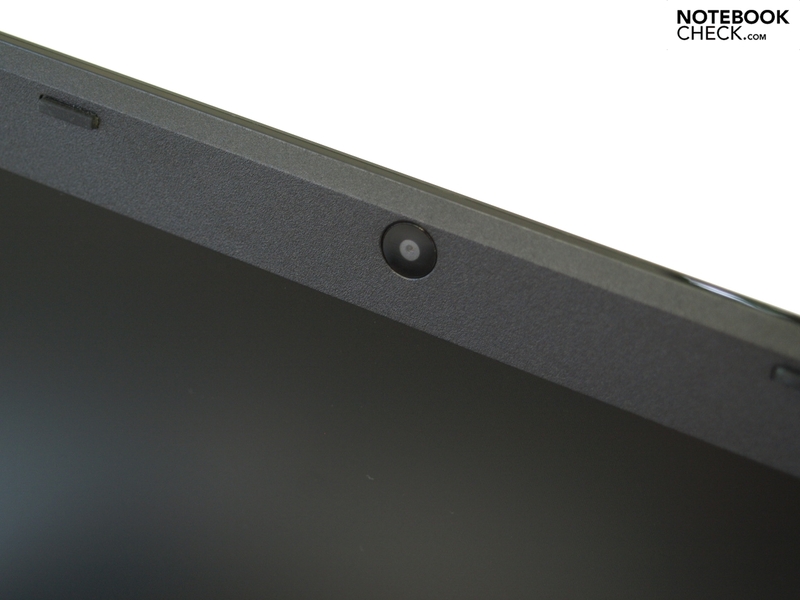 In return, they keep the screen firmly in place and it also only teeters moderately after adjusting the opening angle. A transportation lock has been omitted. The device shows the typical dimensions for a 15.6 incher with a width of 379 mm, depth of 253 mm and a maximum height of 32 mm. Even the weight of 2.45 kilograms including the 6 cell battery and 0.55 kg for the adapter is usual for a device of this size. According to the manufacturer the device is elevated to a height of 52.46 millimeters with the optional 9 cell battery, which protrudes downwards, and thus also is positioned ergonomically for typing. 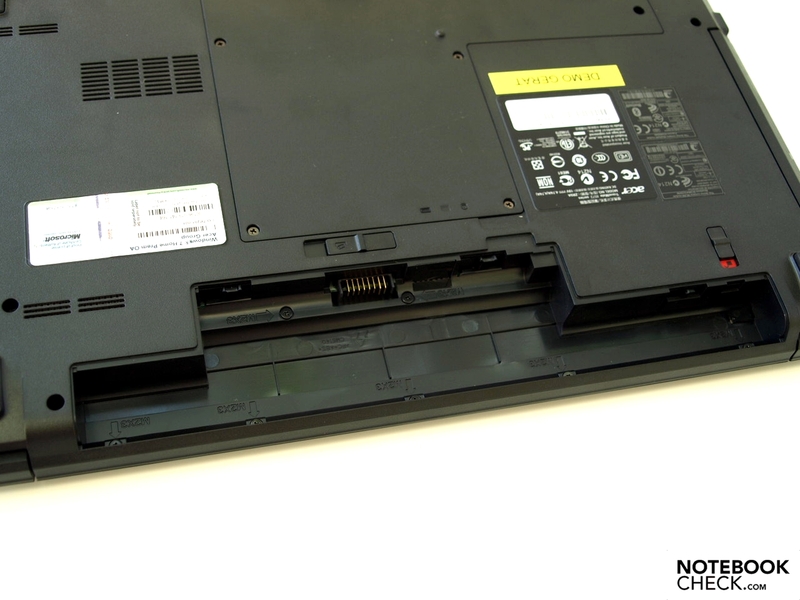 The laptop's weight increases to 2.8 kilograms with this battery. 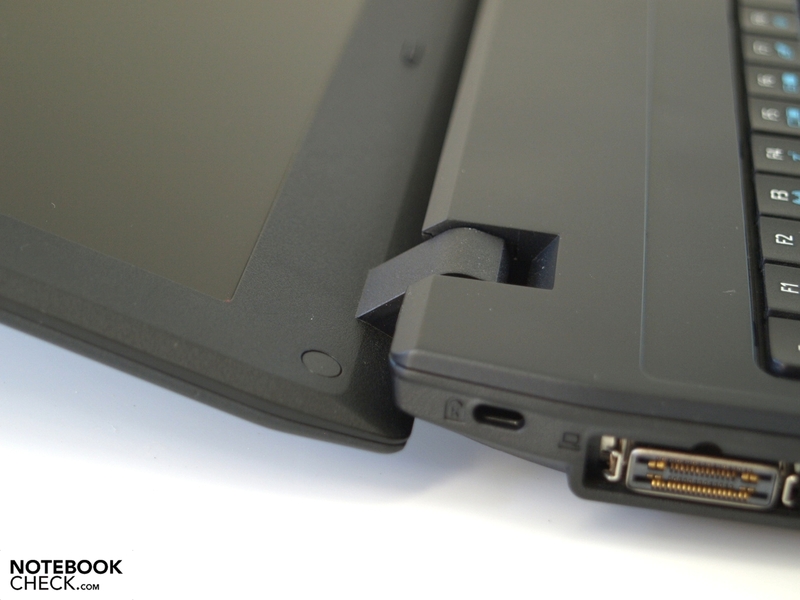 Acer hasn't forgotten the mandatory docking port for devices made for professional use. An Acer EasyPort IV docking station can be connected to it, and which provides 4 USB 2.0 ports, a DVI-D (Digital Video Interface-Digital) connection, a VGA-out, headphone/loudspeaker/line-out, microphone and line-in sockets, a RJ45 Ethernet port and power socket. 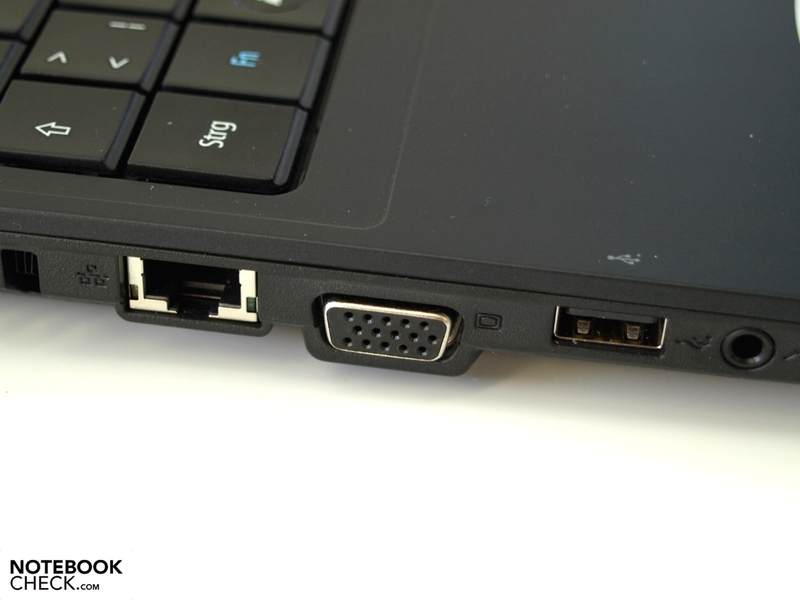 Apart from the fact that docking stations simplify the integration of a the laptop into an existing work environment, the EasyPort IV also offers a significant extension to the otherwise sparse connectivity on the device itself, and that is a digital video interface. 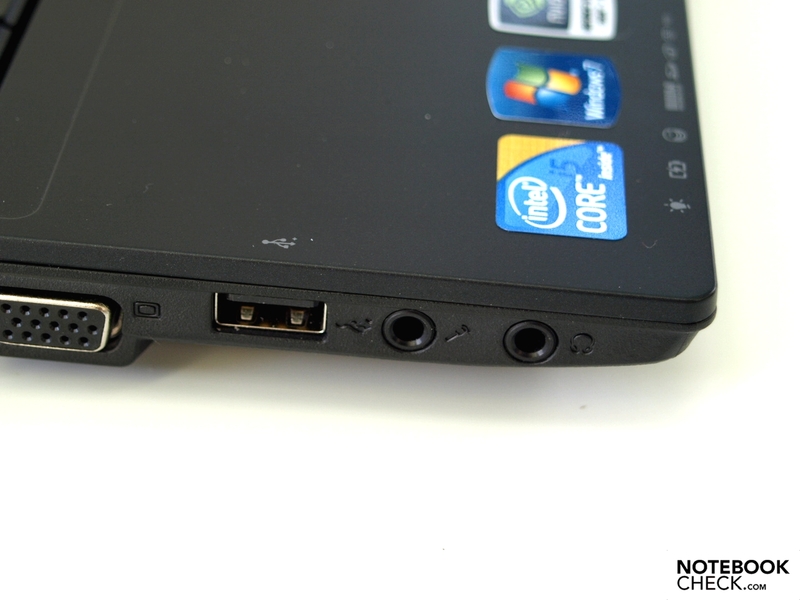 There is only a VGA port on the notebook for connecting an external monitor or laptop beamer. Otherwise, apart from the RJ-11 modem interface, the case only has the minimum: four USB 2.0 ports - no eSATA, USB 3.0 port or powered USB interface - microphone and headphone socket and a mulit-in-1 cardreader that supports SD, MMC, MS, MS Pro and xD formats. 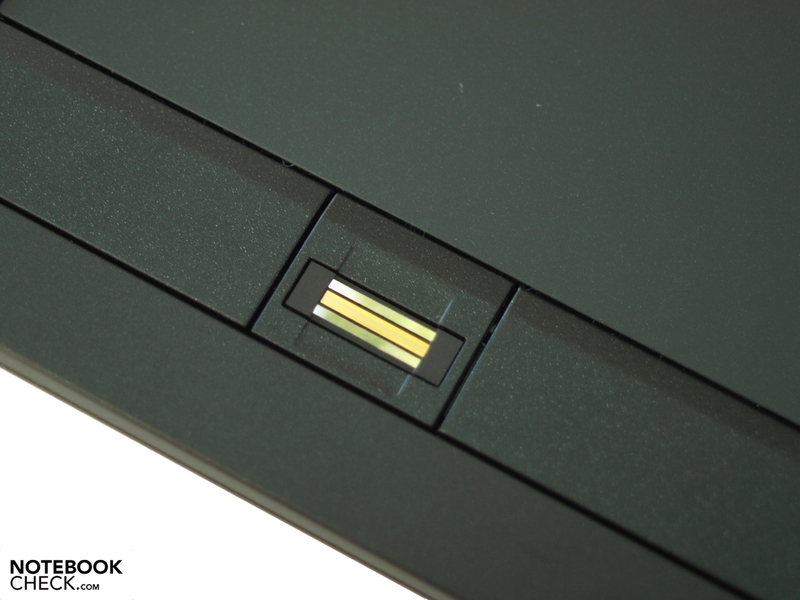 Acer has also waived on an expansion option via ExpressCard. The interface distribution is equally unfavorable for both righties and lefties because the rather permanently occupied interfaces, LAN and VGA on the left and all USB ports on both sides, are in the center to front area. You can be satisfied with the communication configuration. Wired Ethernet connections can be built up with the Broadcom Gigabit Ethernet module (10/100/1000MBit). 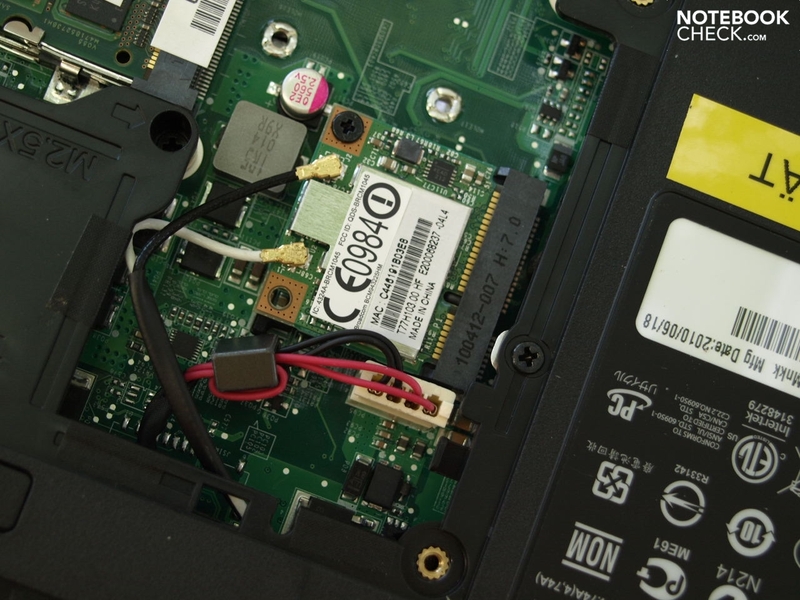 The wireless module, a Broadcom 802.11n (abgn), allows a fast WLAN connection via WiFi hotspots if it's standard n-supported. Finally, the test device can also exchange data with small mobile devices, such as mobile phones or PDAs, via Bluetooth 3.0+HS. A dial-up connection could still be set up with the 56K modem in areas with a poor infrastructure. Additionally, 3G models with a, as its name suggests, broadband modem are available. Such a modem wasn't built into our test device. Together with the installed 1.3 MP webcam, video conferences with business partners and friends aren't a problem. The Acer Crystal Eye webcam supports pictures with up to 1280x1024 pixels and video recordings with a resolution of up to 640x480 pixels. 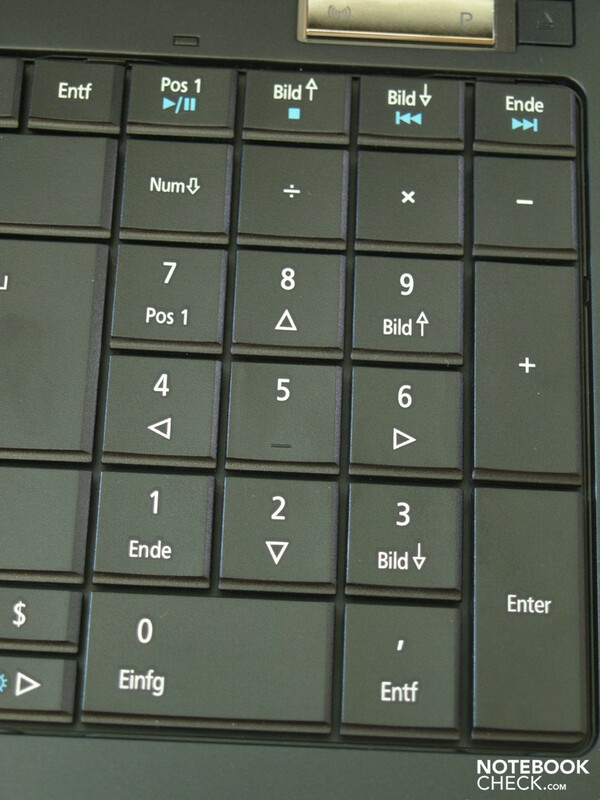 A so-called Acer FineTouch keyboard with 106 keys is built into the test device. The feel of the matt, slightly corrugated plastic keys is actually quite pleasant. The keys are completely flat and the distance to the neighboring keys small. Looking at the alpha-numeric keys' mechanical traits, a fairly short stroke length, a low pressure resistance and a clear, fairly abrupt stop is noticeable. The keys seem rather clattery and wobbly, and are quite loud. The keyboard's substructure coils quite a bit toward the center. In the area of the J, K, L keys you can occasionally even hear a creaking when typing vigorously. On the other hand, the short stroke length, coupled with the smooth keys and standard layout, allow a fast and effortless touch typing. 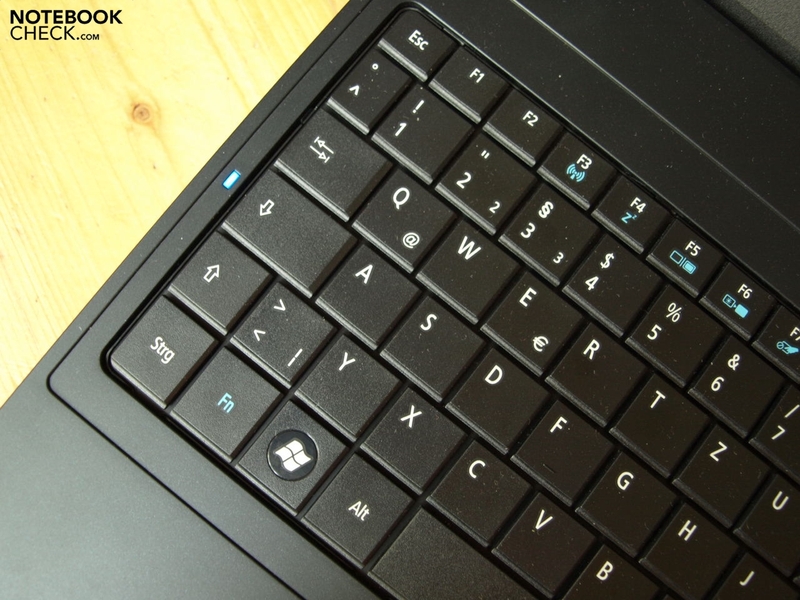 Concave keys and a clearer marking on F and J, as well as a slightly tilted position of the keyboard, as is accomplished with the 9 cell battery, would make typing more ergonomic. 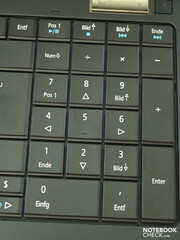 If you have to input numbers frequently, you'll be delighted about the separate number pad. A four column standard layout has been chosen for it. 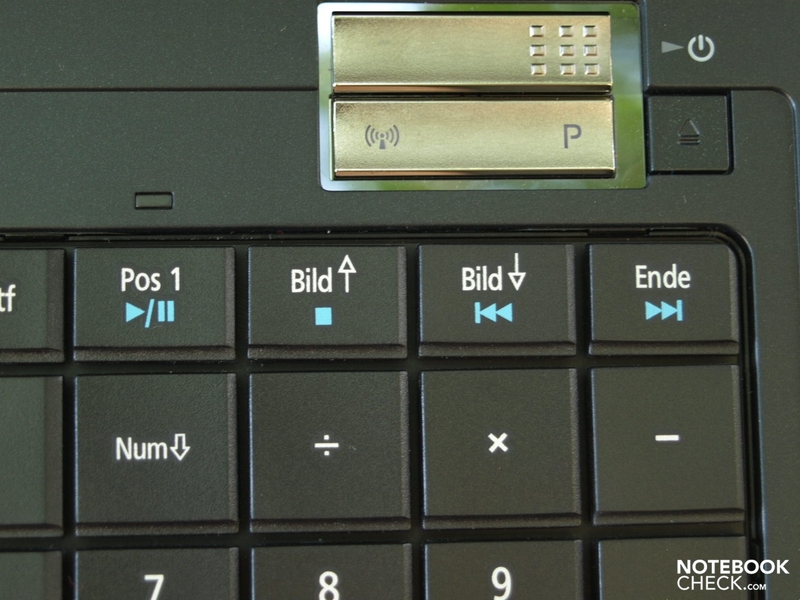 Merely the wireless main control functions (in our case WLAN and Bluetooth) and the Acer PowerSmart key for saving energy above the keyboard's right are found as hot keys. 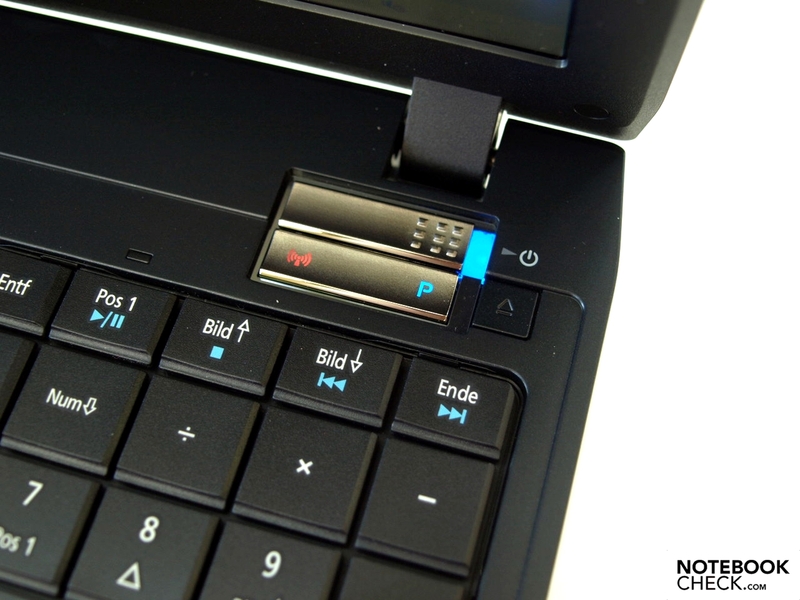 The eject button for the optical drive is located on their right. 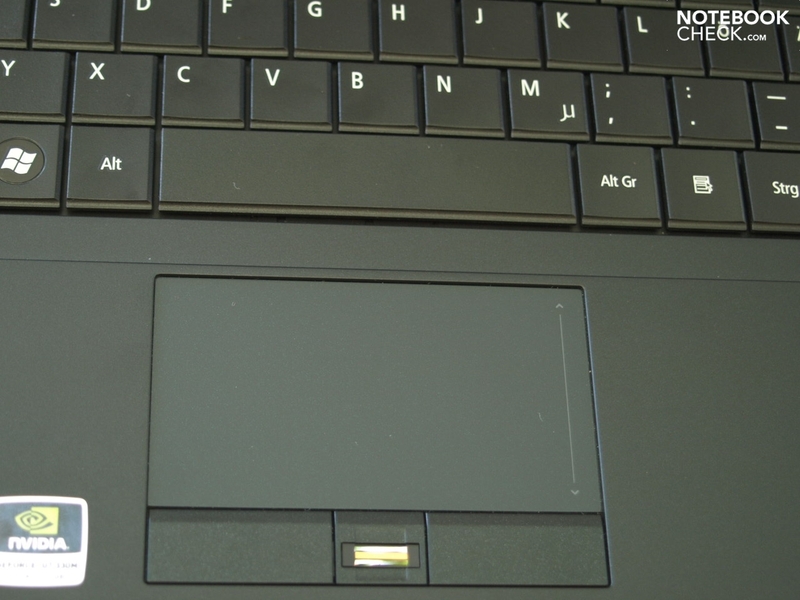 The touchpad is a V7.2 model from Synaptics, which support a range of multi-touch gestures. You can, however, also scroll in the visibly marked vertical scroll area, which is activated standardly, and in the horizontal scroll area, which however has to first be enabled. 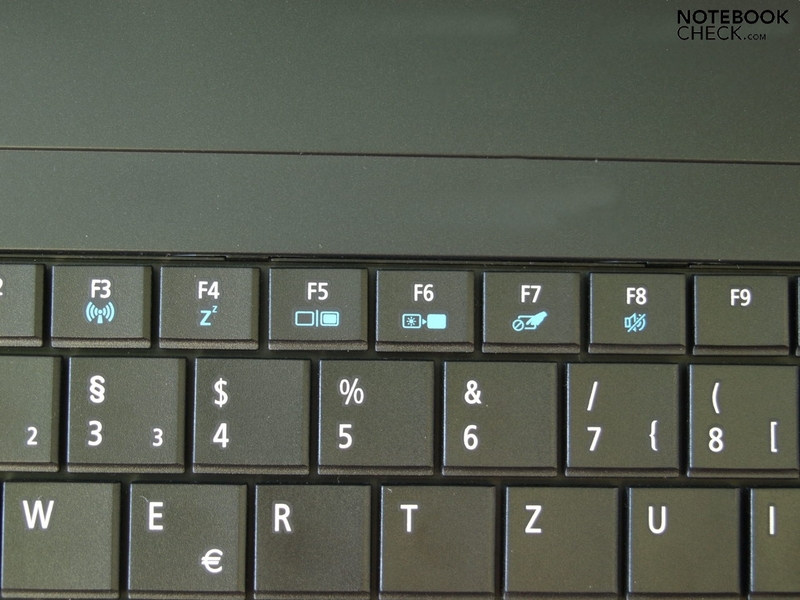 Basically, the touchpad allows abundant configuration options and can also easily be disabled via an Fn+F7 key combination when not in use. 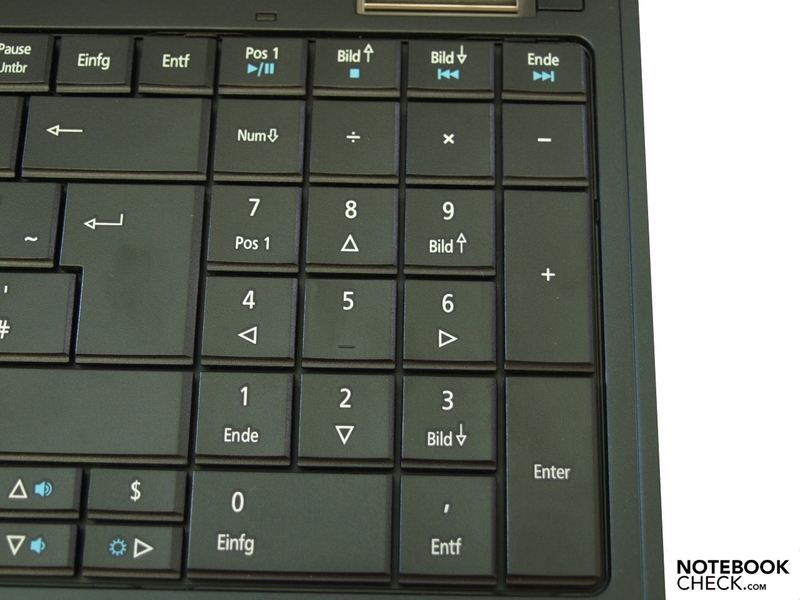 The touchpad keys have a fairly short stroke length and respond homogeneously over their entire extent. The fingerprint reader implemented between them is an additional security feature beside the Kensington Security Slot. 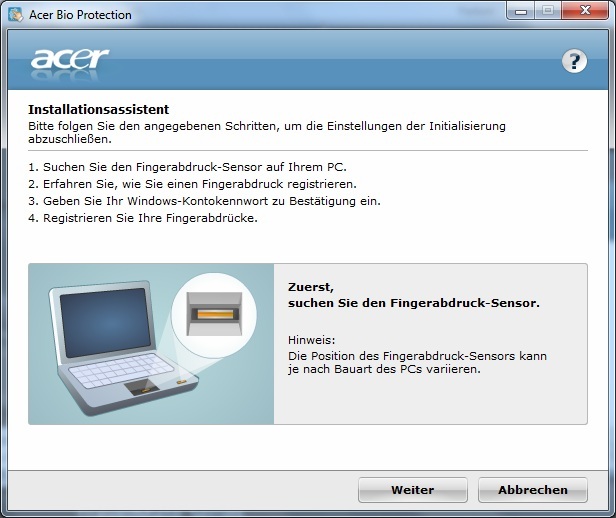 It's easy to set it up with the Acer Bios Protection software and to then on replace password entering with a more comfortable fingerprint scanning. The screen is a display from AU Optronics, namely an AUO41EC. It has a matt - that is an AR-coated - surface compliant to its intended professional use. 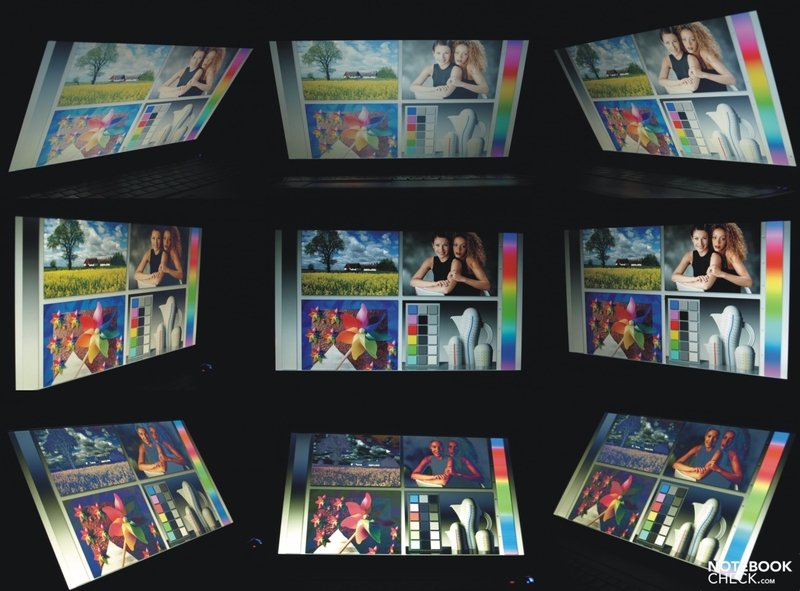 The 15.6 inch screen has a maximum resolution of 1366x768 pixels, so a cinematic friendly 16.9 format. On the one side, you gain a few pixels of width in comparison to, for example, the standard 4:3 size, but you have to live with less height. This means that you have to scroll sooner and more frequently in prevalently vertically aligned office applications. On the other side, 1366 of width are usually not enough to, for example, display two application windows completely beside each other. The screen is disappointing in terms of the evaluated data. The average brightness is just only 158.8 cd/m2. The maximum of 178.6 cd/m2 was measured in the screen's center. As of there, the brightness decreases in all directions, especially towards the lower left. Only 144.7 cd/m2 are measured there. The brightness is nevertheless enough for indoor use. The illumination of 81% is good. The high black value of 1.12 cd/m2 is less agreeable. That in combination with the relatively low brightness results in a moderate contrast of only 159:1. You would even hope for a more saturated black, a brighter white and somewhat more vivid colors subjectively. Dimming or streaks aren't evident to the naked eye when large, monochrome pictures are displayed. In any event, text is always displayed legible and focused. Outdoor use isn't a problem due to the matt surface, at least in the shade. A brighter display would have been desirable for use in direct sunlight, anyway. The horizontal viewing angles turn out to be generous, as usual. It's striking that a contrast loss turns up quite fast, especially when looking down, and subsequently color changes appear when deviating from the optimal perpendicular view on the vertical plane. The desktop's stability is significantly larger when looking up. 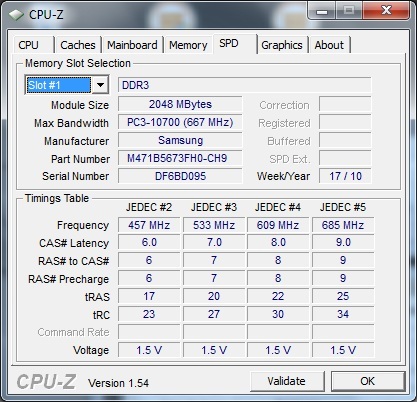 The mainboard uses the HM55 chip set. 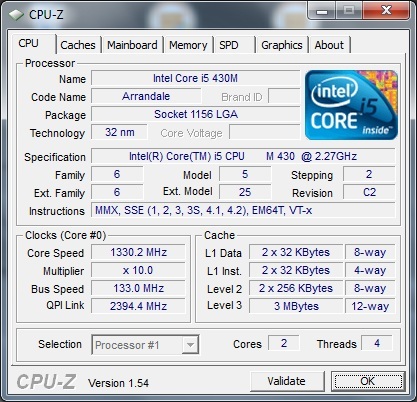 On this a Core i5 processor, to be more precise a i5 430M, manufactured under the code name Arrandale has been placed. It is a dual core processor that, depending on the load, clocks between 2.26 and 2.53 GHz with assistance from Turbo Technology. 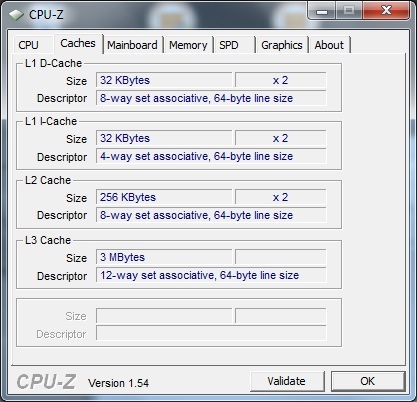 Due to hyperthreading, four threads can be managed simultaneously. However, support for Virtualization Technology for Directed I/O (VT-d), Trusted Execution Technology and AES New Instructions are reserved for more expensive Core i5 processors. Beside the integrated GMA HD graphic chip in the processor, a dedicated Geforce 330M has also been installed in the TravelMate 8572TG. It is an old acquaintance that we often find in devices, which are supposed to provide fairly good graphics performance, just like the Radeon 5650 from the competitor ATI. It is a midrange graphic card that supports DirectX 10.1, as well as video decryption in the graphic chip (PureVideo HD with VP4) for less CPU load during HD decryption. 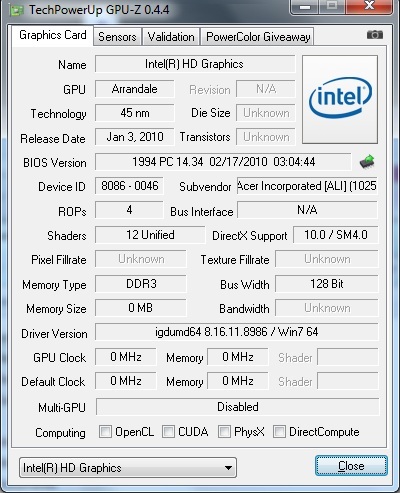 The stream processors can also be used for other applications due to CUDA, DirectX Compute, OpenCL and PhysX support (video encryption, physical effects, etc.). In opposition to the above mentioned Mobility Radeon HD 5650 from ATI, the GT 330M doesn't support DirectX 11 effects and also has a slightly poorer ranking. Nevertheless, current and demanding DirectX 10 games (like Crysis or Risen) run smoothly on the GT 330M with up to medium details and medium resolutions. In any case, the graphic chip integrated in the processor, a GMA HD, is sufficient for non-3D-intensive applications. It also bids hardware acceleration for HD video decryption. How you can switch between both graphic cards and what effect it has on the power consumption can be read in "Battery Life" further below. 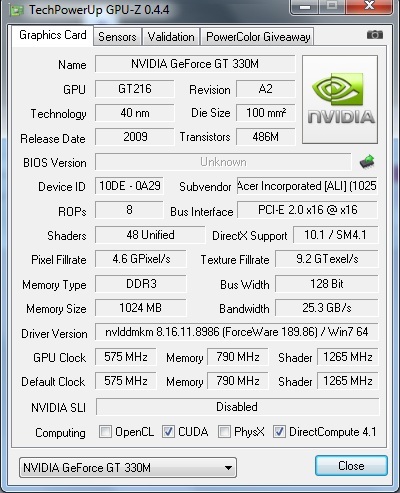 Our performance tests have been executed with an enabled GeForce GT 330M. 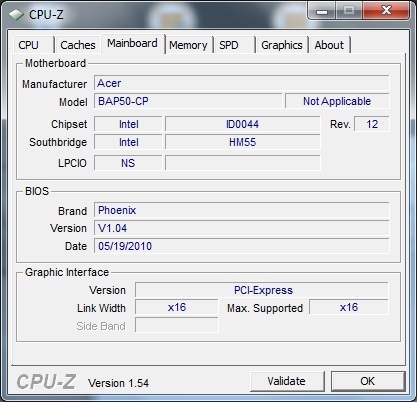 The system is supported by a four gigabyte DDR3 RAM. 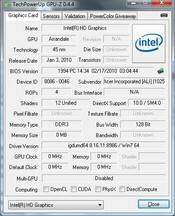 They are also used efficiently by the pre-installed 64 bit Microsoft Windows 7 Home Premium. 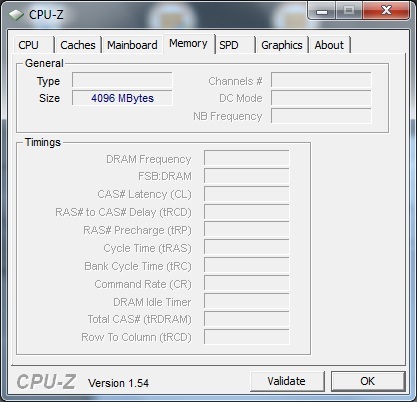 The CPU performance complies with the expectations set on the hardware configuration. In the test with Cinebench R10's 64 bit version, the device achieves 3306 points in the single rendering and 7632 points in the multi rendering. 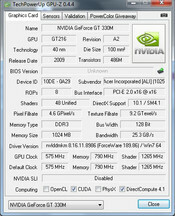 Dell's Vostro 3500 (430M, NVIDIA GeForce 310M) with Window 7's 32 bit version scores about equally in the 32 bit version. 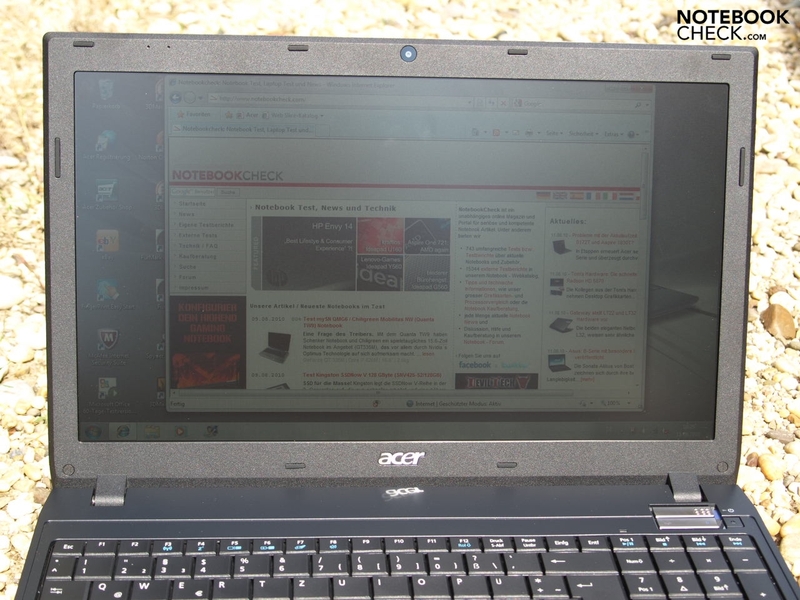 The same applies to HP's Probook 6540b (430M, ATI Mobility Radeon HD 4550). 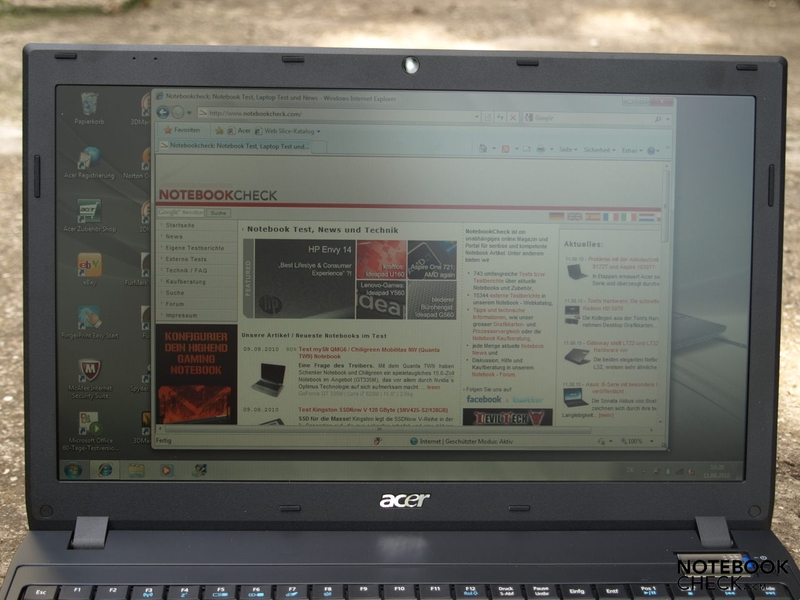 Toshiba's Tecra-A11-125 competes with Windows 7's 64 bit operating system and GMA HD graphic chip, and also achieves comparable results in the 64 bit version. At first everything seems to stay in the green zone in the latency test with DPC Latency Checker. However, as we open paint for a screenshot, the latencies start to surpass the critical times. After a few trials, we found out that this behavior is provoked as soon as another window gets the focus even without being used. For example, an opened notepad in the foreground is enough. 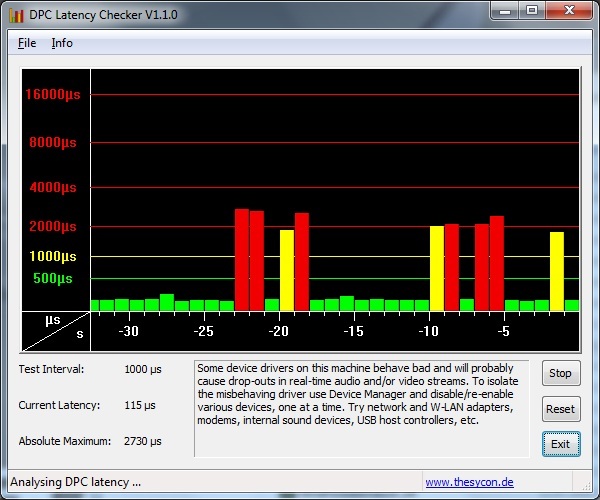 As soon as the DPC Latency Checker again has the focus, the latencies fall again and stay in the green zone. 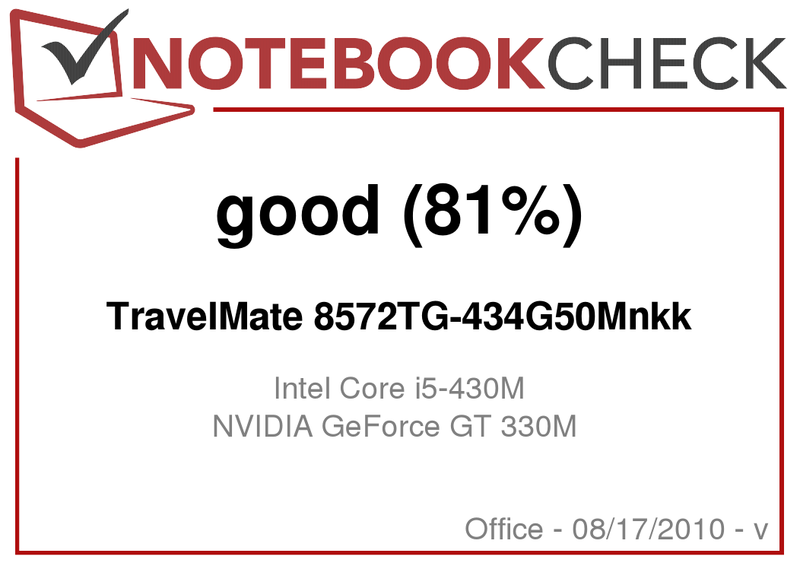 The Acer TravelMate 8572TG achieves a total rating of 5707 points in the PCMark Vantage test, which evaluates the entire application performance of a system and the interaction of components, and thus surpasses the Toshiba Tecra A11-125 (430M, GMA HD) marginally, which reaches 5676 points. 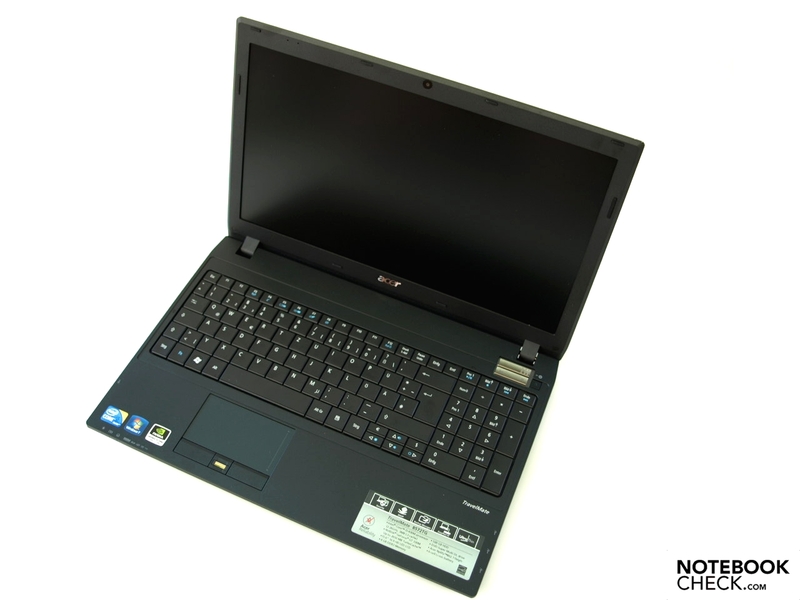 The Dell Vostro 3500 scores worse with 5340, the HP Probook 6540b (430M, ATI Mobility Radeon HD 4550) is defeated. It becomes obvious that the graphic card has a minor impact on the PCMark Vantage test. A common hard disk with a gross capacity of 500 gigabytes is built-in as the mass memory. 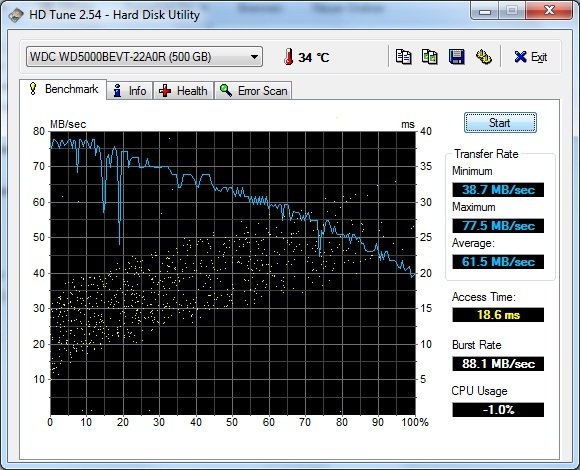 The WDC WD5000BEVT-22A0R from Western Digital works with a revolution speed of 5400 rpm. The performance rates, assessed by HDTune, don't show any irregularities. The optical drive is a HL-DT-ST DVDRAM GT31N. It stays fairly quiet and inconspicuous during DVD rendering. In particular an efficient graphic card is vital for an attractive gaming performance. The Nvidia GeForce 330M is no longer a stranger and thus accordingly many entries are available in our database. The midrange graphic card's results are also applicable to the TravelMate 8572TG, except for fluctuations caused by the system (CPU). In order to verify this, we executed a few benchmark tests. The test device achieves 3233 points in Cinebench R10 64 bit shading test. It is on par with Dell's Vostro 3500 with its 32 bit result. In return, the HP Probook 6540b (430M, ATI Mobility Radeon HD 4550) can clearly distinguish itself from them with 4393 points - not to mention systems with Mobility Radeon HD 5650 graphic cards, such as the TravelMate 5740G-524G50MN (Core i5 520M) that for example achieves 4862 points. The rally classic is quite demanding in terms of graphic requirements. An average of 48 fps in medium details (1024x768, medium, 0xAA) is still possible. Increasing the detail level to high and the native HD resolution results in the game crashing. The GeForce 330M can only cope with the fantasy adventure, Risen, in the lowest settings. 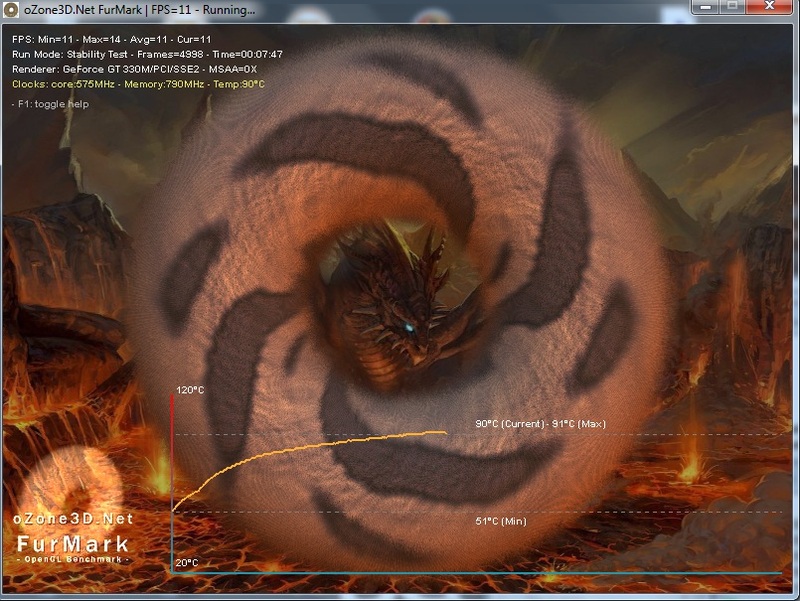 79 fps are possible with 800x600 pixels and low details. The TravelMate can only achieve 27.8 fps in Risen's medium settings (1024x768, medium, 2xAF). The adventure is no longer smoothly playable with that. The GeForce 330M is very well capable of rendering current games smoothly, if you can accept restrictions in graphic quality and resolution. Smooth frame rates are still possible with up to medium details in the majority of demanding 3D games. The GPU's performance isn't adequate for higher frame rates. The TravelMate 8572G is agreeably quiet in modes with a low load. The noise level is usually 32.7 dB(A), which hardly ever increases to 37.2 dB(A). The test device is considerably louder under load. Thus, the noise level already reaches a consistent maximum of 41.7 dB(A) after a few minutes of our stress test with enabled Nvidia GeForce 330M. This is very audible, however it is still well acceptable due to the consistent low frequency noise. Overall, you can be satisfied with the fan control that is characterized by a homogeneous, consistent behavior in all modes. No serious temperatures were noticed in use under low load, for example internet applications or office tasks. Overall, the laptop stayed pleasantly cool. That wasn't so in our stress test, which however loads the graphic card and processor to 100% for several hours. Such a case will hardly turn up in practical use, so the temperature rates will be more or less lower, depending on the load, in routine use. The case heated up considerably during the stress test, despite the loud fan. A maximum of 42.6 degrees Celsius are reached on the upper side, in the right keyboard area. That and the touchpad feel evidently warm, subjectively. The bottom gets very hot with peak rates of almost 50 degrees Celsius. A use on the lap can, for example, also get unpleasant during demanding 3D games, while it's possible without problems under low load. The component's temperatures inside increase during the stress test intensely after a short period. 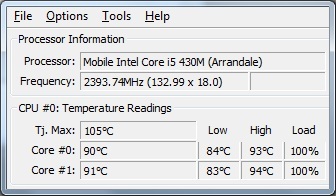 After a few hours, the GPU reaches up to 92 degrees Celsius and the CPU cores up to 94 degrees Celsius. A core rate drop could be recorded repeatedly for moments with the TMonitor tool, but it doesn't come to a performance throttling. That is also confirmed by the 3DMark06 test executed subsequently, whereas the temperatures only deviated slightly from the cold rates. The loudspeakers are on the beveled front edge and emit its sound waves more or less towards the table's surface. As expected in devices without a subwoofer, the sound lacks bass. Midranges and trebles are quite balanced and natural. Although it's possible to improve the sound significantly by connecting external loudspeakers or high-quality headphones to the 3.5 mm headphone socket, musicals, like "Phantom of the Opera", can be enjoyed with the internal loudspeakers from DVD. 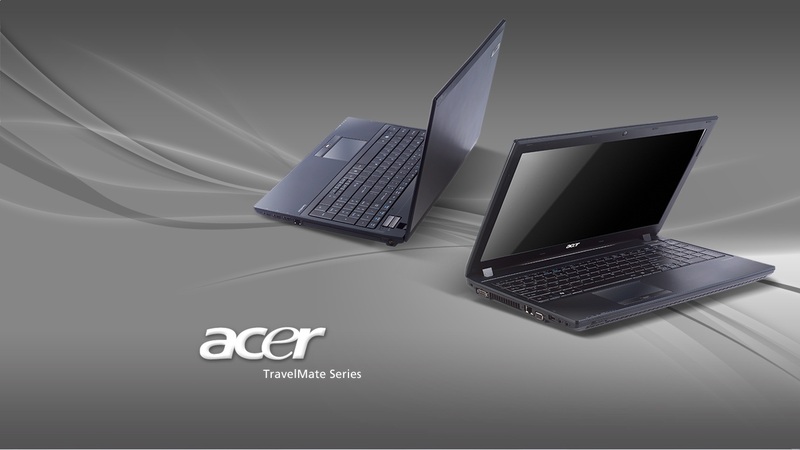 Acer's TravelMate 8572TG tries to reduce the power consumption independently in battery mode. Regardless of the previously fixed energy settings, it enables a few energy savings functions without the user's interference. For example, the display brightness is reduced, it makes the attempt to switch to the integrated graphic chip and the PowerSmart's LED button lights up without the user's intervention. The device's determination to override the previously made settings and to partly overwrite them was very annoying during the battery test. But on the other hand, an inexperienced user doesn't have to worry about the optimal energy settings because the laptop tries to save energy autonomously as soon as it's switched to battery. 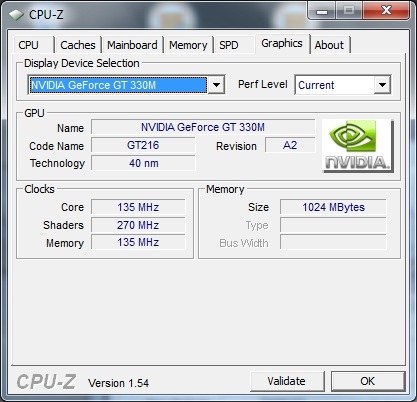 By the way, the device does not use Nvidia's Optimus Technology to switch the graphic cards automatically, depending on the power requirements. Instead, the energy management or the user is responsible for manual switching. A drawback of this alternative is that almost all applications have to be closed in order to switch, in opposition to Optimus. Additionally, the display temporarily turns black during switching. Now to our assessments. 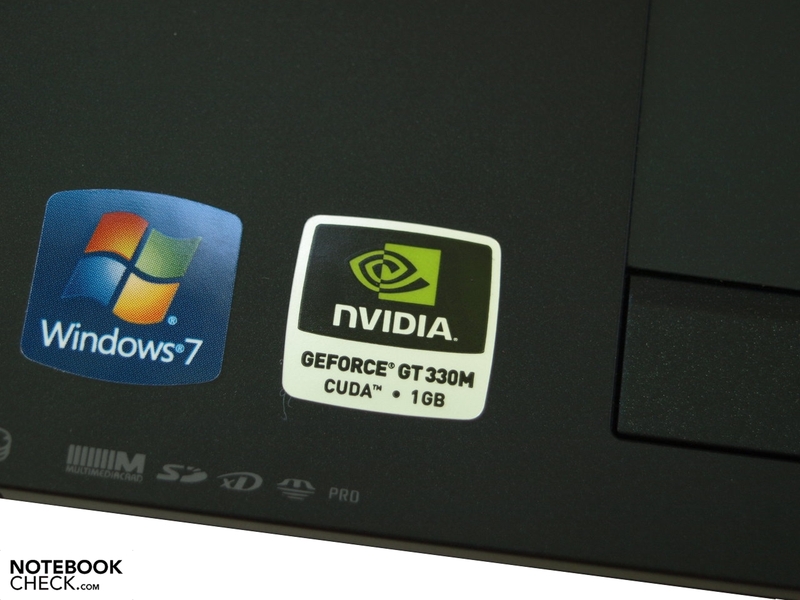 They are in the midfield of similarly equipped devices with both enabled GMA HD graphic chip, as well as enabled Nvidia GeForce GT 330M and are, for example, comparable to Toshiba's Tecra A11-125 (430M,Graphics Media Accelerator HD Graphics), HP's ProBook 6540b (430M, Graphics Media Accelerator HD) or Toshiba's Qosmio F60-10H (430M, GeForce GT 330M). 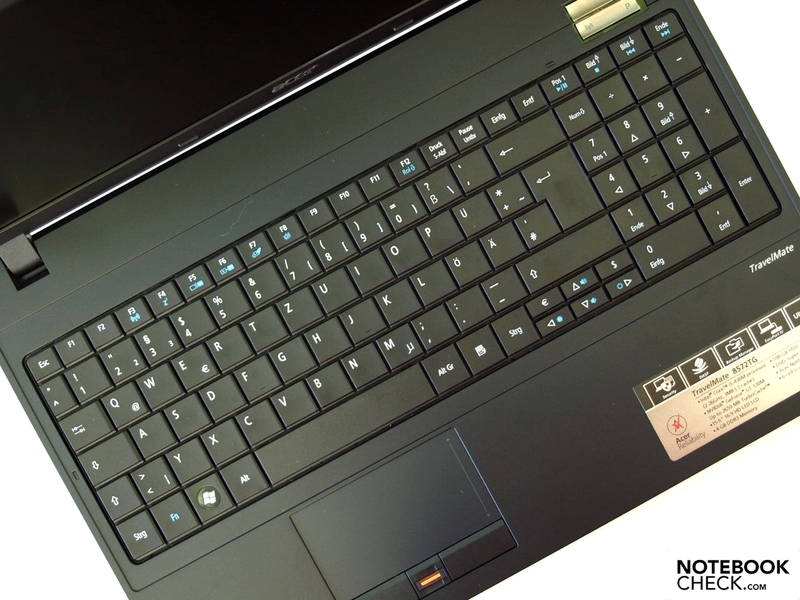 If the laptop is turned off or in standby mode, the rates agreeably stay under 0.5 watts. 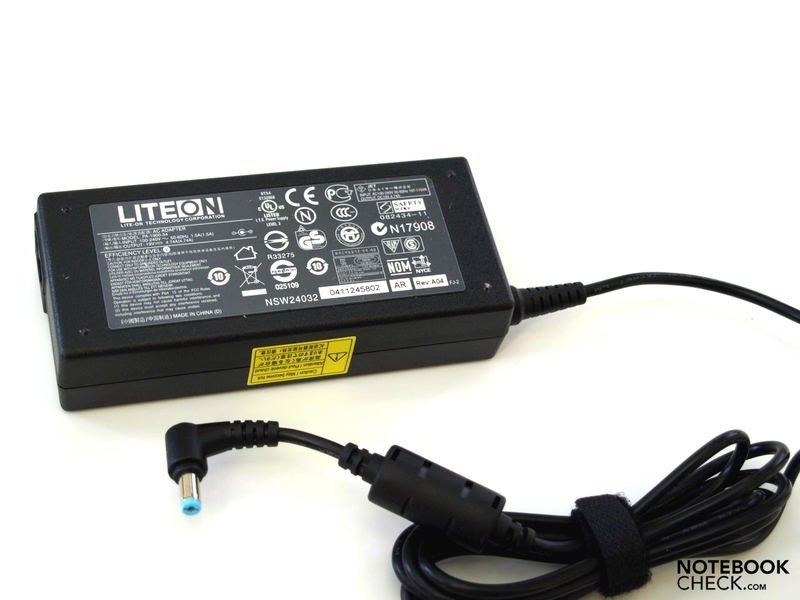 Furthermore, the 90 W power adapter is sufficiently sized for the maximum measured power consumption of 77.4 watts. Of course, the possible battery runtimes are strongly dependent on the enabled graphic card and the energy settings. Incidentally, the PowerSmart functionality was disabled via the button for all tests because the selected and, for our tests, standard settings were overridden with enabled PowerSmart. The active graphic card was set manually, or rather checked. The runtimes were determined with the included 6 cell lithium ion battery with a capacity of 66 Wh. The GT 330M graphic card is enabled, the high-performance profile selected and the wireless modules on and high load is simulated in the worst case. The latter is taken care of for us by the BatteryEater Classic Test tool. The computer shuts down automatically after 98 minutes. All other tests were executed with a disabled GT 330M and thus enabled GMA HD. This also applies for the DVD test because the GMA HD has enough power for rendering videos. The maximum runtime was also executed with the BatteryEater tool, but with the Reader's Test. Reading a text with minimum display brightness, disabled wireless modules and energy savings profile is simulated here. Almost five and a half hours (331 minutes) are possible under such restrictive work conditions. At least it's possible to surf for almost four hours via WLAN on the internet with good brightness and in energy savings profile. Finally, our DVD test supplies a bit more than three hours of movie entertainment remote from the mains in the profile "balanced", with maximum brightness and disabled wireless modules. If the battery life is too short for the one or other user, he can optionally buy a 9 cell battery with a 90 Wh capacity. In comparison to the 6 cell battery with 66 Wh, it has a higher capacity of about 36%. Accordingly longer battery runtimes can be expected with it. The TravelMate 8572TG has been designed to be a travel companion for professionals who occasionally need a bit more graphics performance. It has a weight of about three kilograms at a size of 15.6 inches and comes with a 6 cell battery. Thus it's rather at the upper limits of what you want to carry around. In return, it has a display with a reasonable desktop size and resolution, which is even AR coated and thus suitable for professional use. Unfortunately, the maximum brightness is fairly low so that you should look for a shadowy place for outdoor use. We liked the good communication configuration, which also includes a RJ-11 modem port beside wireless and Ethernet modules. There are also 3G models available. Otherwise the connectivity is somewhat sparse and neither has a digital video out nor eSATA or USB 3.0. 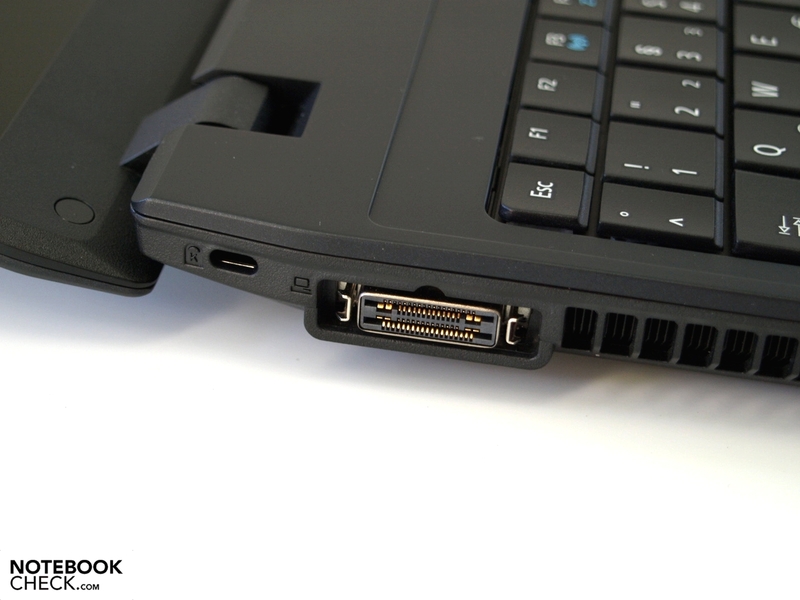 At least the first can be obtained via docking solution in form of DVI-D interface. The device's performance can be fairly well adapted to current performance, or rather battery life requirements. 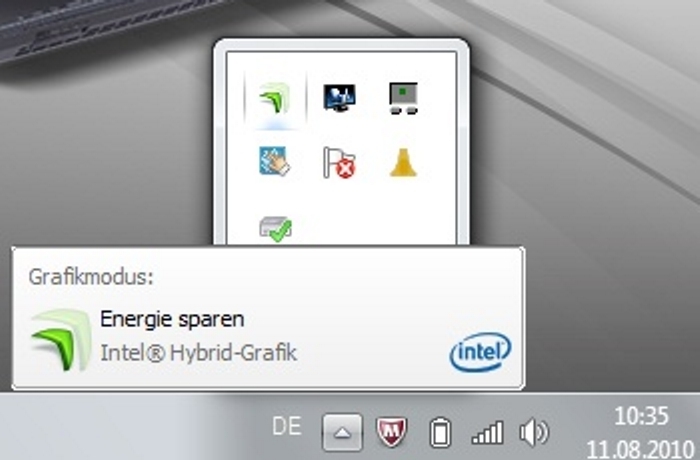 Here, the enabled graphic card can be selected manually. Nvidia's Optimus Technology isn't used. Acer's energy management, however, tries to select the optimal settings independently in battery mode and often does that quite determinedly. In return, the device bids an attractive graphic performance with a enabled GeForce 330M graphic card, which even occasionally allows the one or other demanding 3D game when requirements on details and resolution aren't all too high. Overall, the TravelMate 8572TG proves to be a timeless, elegant business device with modern hardware and adaptable performance. If the one or other flaw is significant has to be decided individually. In any case, it can be called interesting in view of its value for money ratio. Acer TravelMate 8572TG in a timeless and elegant black with a few chrome elements. The arrow keys have turned out a bit too small. ... is easy to configure. Access to all important components via a large maintenance cover. The notebook gets quite warm and loud during the stress test. The graphic card's temperature already increases within a short time. The CPU also gets very warm. Performance throttling wasn't observed. Energy can be saved and battery life can be increased by switching to the integrated GMA HD graphic chip. Just like for multimedia control. 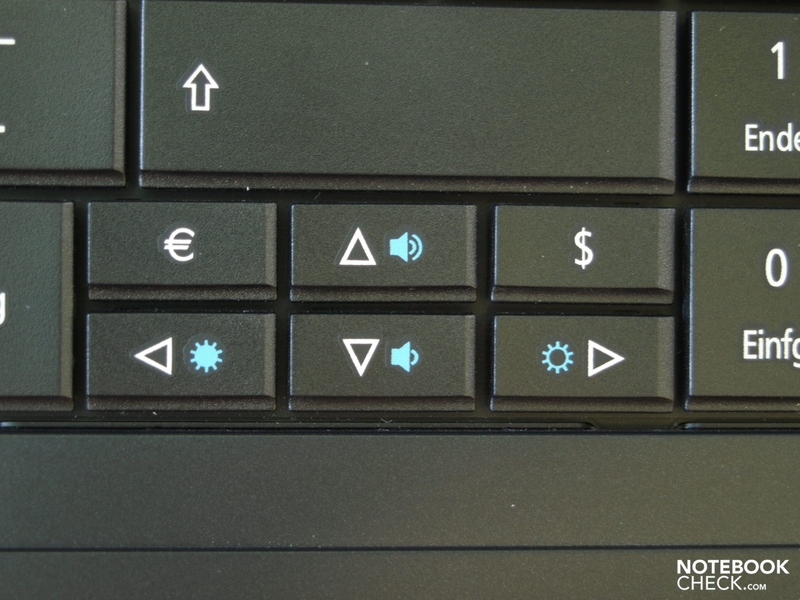 Controlling important functions via FN key combinations. 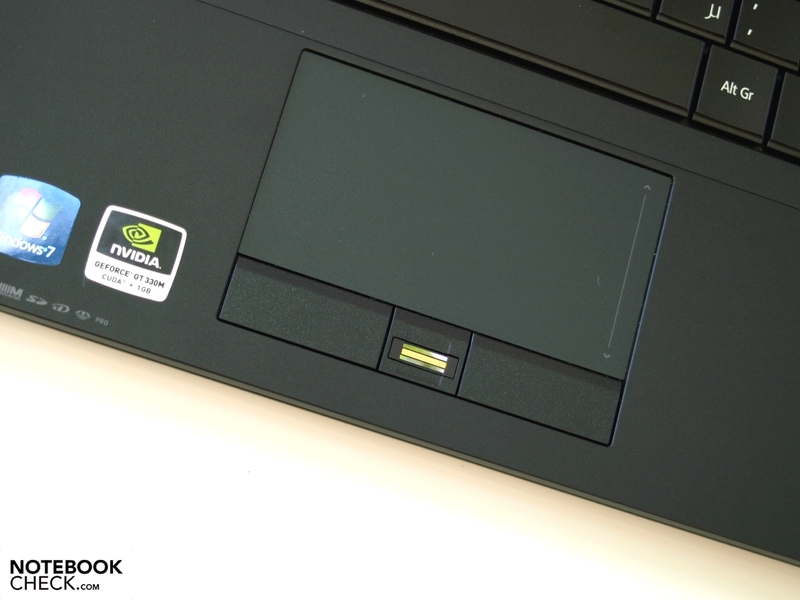 Slider for power-on, wireless main control, PowerSmart button and the optical drive's eject button. 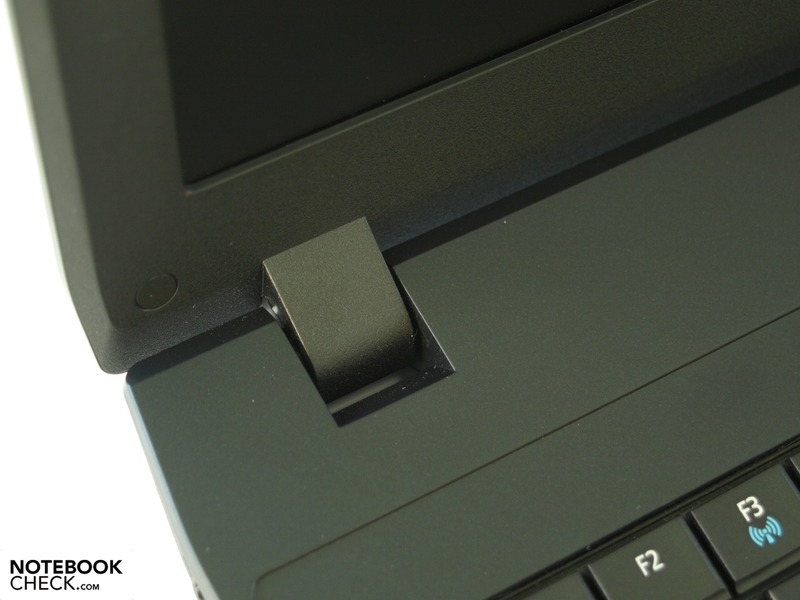 Fairly small, stiff hinges keep the display firmly in place. The opening angle is generous. Matt 15.6 inch display with moderate brightness. Contrast-rich, legible labeling of the interfaces. Left rear: Kensington Security Slot followed by docking port and fan. RJ45 (LAN) and VGA on the left side's center to front part. 1 USB 2.0 and both audio sockets are on the left far front. Three additional USB 2.0 ports on the rights front edge followed by a RJ-11 (modem) interface. The good communication configuration and the 1.3 MP webcam make video conferences possible. The keyboard's typing feel isn't impressive. In return, it has a separate number pad. 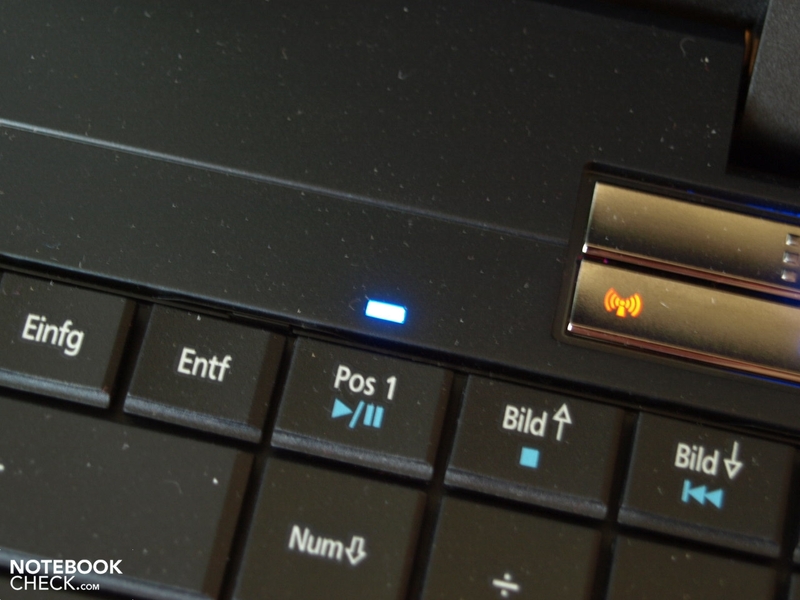 ... the status LED for caps lock are in the area of it at the keyboard's edge. The power adapter is sufficiently sized. Switchable graphics and thus adaptable performance. Interfaces like eSATA or USB 3.0 or at least an expansion possibility ala ExpressCard. Business devices in a 15 inch size at a low price. 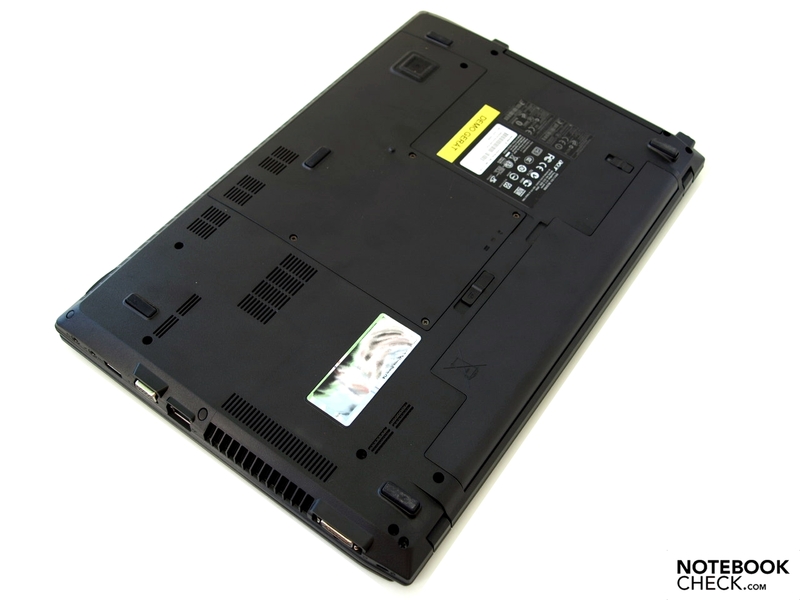 Candidates are found, for example, in Dell's Vostro family (Vostro 3500) or among HP Probooks (6540b). Hybrid graphic solutions are hardly found among inexpensive starter devices, though.